Brandon University welcomes students to campus, and to Brandon. 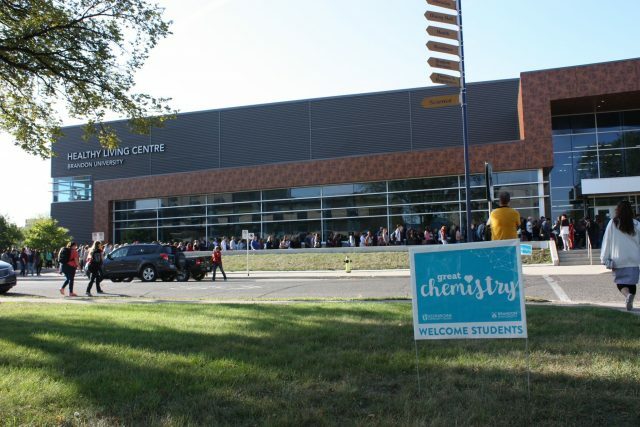 Continuing the success of a campaign launched last year, Brandon’s two post-secondary institutions are joining together to welcome students to Brandon for the new academic year. Through boulevard signs, banners, and a social media and advertising campaign, Brandon University (BU) and Assiniboine Community College are once again taking advantage of the back-to-school season to showcase and celebrate the importance of students to the community. This year’s campaign focuses on the “Great Chemistry” of the partnership between ACC and BU, as well as the benefits that students bring to the community. This year’s theme, “Great Chemistry,” highlights the ongoing partnership between the two institutions as well as the benefits that the two institutions — and especially their students — have for the city of Brandon and wider Westman. Many of the opportunities and resources that are developed for students are also community resources as well. Supported by large student populations, BU and Assiniboine are able to offer facilities and events for everyone — from the annual events held at the Manitoba Institute of Culinary Arts at Assiniboine’s North Hill Campus to BU’s performing arts spaces, research laboratories and the Healthy Living Centre. 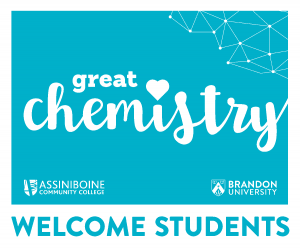 Assiniboine Community College welcomes students with a “Great Chemistry” sign. The “Great Chemistry” campaign is being boosted by people, community organizations and businesses who have volunteered to host the distinctive signage in their offices or storefront, or who have placed signs in their yards or windows. Any organizations that want to participate can request a sign or banner be delivered to them simply by emailing either institution at communications@assiniboine.net or communications@brandonu.ca. This year’s “Great Chemistry” theme builds on last year’s successful “Welcome Students” initiative. The joint campaigns also help demonstrate the deepening tradition of collaboration between Assiniboine and BU. In 2014 the institutions, along with the Province of Manitoba, signed Growing Together – Vision 20/20, a memorandum of understanding aimed at fostering collaboration between the two institutions to meet student, community and social needs. 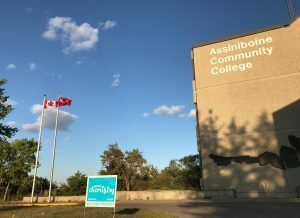 With ongoing partnerships that include students sharing residence space and transferring credit through 2+2 programs, the institutions continue to make Brandon a city where students can find the options, flexibility and amenities that they are looking for when pursuing their post-secondary education.